Tasks that are important and urgent are assigned to the top-left box. These are the tasks that you should tackle first. Tasks that are important but not urgent are assigned to the top-right box. You should look at your schedule and figure out a good time to get these tasks done. Set some deadlines for yourself, if you think that would be helpful! 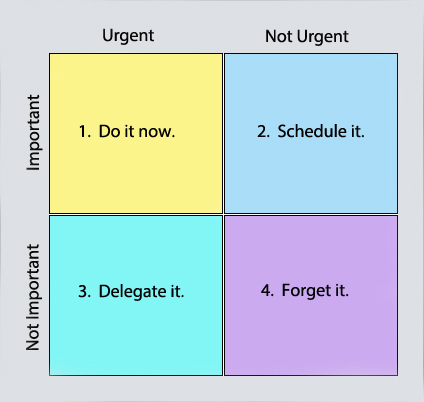 Tasks that are urgent but not important are assigned to the bottom-left box. Try to delegate these tasks to others, if possible. This method should help you to get organized, finish your most important tasks first, and increase your productivity! It will also help you to avoid wasting time on things that aren’t important.